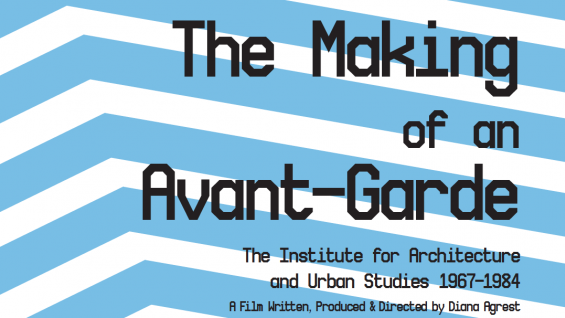 The film THE MAKING OF AN AVANT-GARDE: The Institute for Architecture and Urban Studies 1967-1984, a documentary written, produced and directed by Diana Agrest, is scheduled for several screenings as well as being selected for upcoming film festivals. The Princeton University School of Architecture will be screening on October 1, 2014 and UC Berkeley College of Environmental Design will be screening it on October 8, 2014 followed by a panel discussion with Agrest, Nicholas de Monchaux, Sylvia Lavin and Stanley Saitowitz. The film has also been selected for the 10th Annual Cinema Orange Film Series presented by OCMA and Newport Beach Film Festival at Orange County Museum of Art, Newport Beach, CA, on Thursday November 6, 2014, as well as being officially selected for the San Diego Design Film Festival 2014.